Leslie Terence Owen is an English former footballer who played as a striker. He is the father of former England international striker Michael Owen. 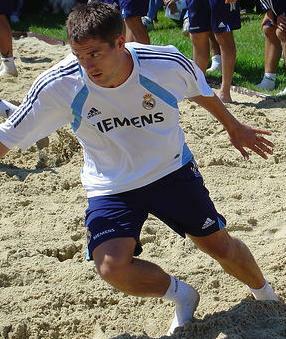 Owen moved to Real Madrid for £8 million in mid-2004; he was frequently used as a substitute. He scored 13 goals in La Liga before returning to England the following season where he joined Newcastle United for £16.8 million. After a promising start to the 2005–06 season, injuries largely ruled him out over the next 18 months. After his return, he became team captain and was the team's top scorer for the 2007–08 season. Newcastle were relegated in the 2008–09 season and Owen moved to Manchester United as a free agent. He spent three years at Old Trafford before joining Stoke City in September 2012. Owen is one of nine players to have scored 150 or more goals in the Premier League. He is also the youngest player to have reached 100 goals in the Premier League. On 19 March 2013, Owen announced his retirement from playing at the end of the 2012–13 season. During the 2007-08 season, Newcastle United participated in the Premier League. Newcastle started the season reasonably well under the management of Sam Allardyce and looked to be in the hunt for European places by the end of October, but a poor November saw the team slide down the table as fans began doubting Allardyce's ability. Despite a reasonable upturn in early December, the team fell further form wise and in the end Mike Ashley chose to terminate Allardyce's contract by mutual consent. Chester City Football Club was an English football team from Chester that played in a variety of leagues between 1885 and 2010. The club, which was founded as Chester F.C., joined the Football League in 1931. Over the next eight decades, the club spent most of its time competing in the lower divisions playing its home games at Sealand Road (1906–1990). It was renamed Chester City in 1983. The club moved to the Deva Stadium in 1992 after playing two seasons of home games at Macclesfield Town's Moss Rose. Chester won the Conference National in 2004, its only league title. Ian James Rush, is a Welsh former professional footballer who played as a forward. 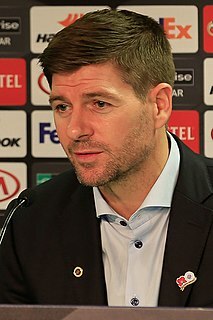 At club level Rush played for Liverpool from 1980–1987 and 1988–1996. He is the club's all-time leading goalscorer, having scored a total of 346 goals in all competitions at the club, including a record 25 goals versus Merseyside derby rival Everton. 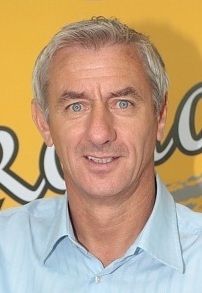 At international level, Rush made 73 appearances for the Wales national football team and remained the record goalscorer for his country until 2018, with 28 goals between 1980 and 1996. Gary Andrew Speed, MBE was a Welsh professional footballer and manager. Mold Alexandra F.C. is a football club based in Mold in Wales. A founder member of the League of Wales, the club are now playing in the Welsh National League, the third tier of Welsh football. The club has played at Alyn Park since they were founded in 1929. 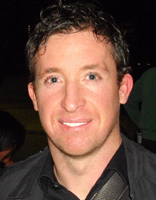 Owen replaced the injured Robbie Fowler as Liverpool's first choice striker in 1997–98. He won the Premier League Golden Boot and was awarded the PFA Young Player of the Year award. Owen also finished in third place in the PFA Player of the Year voting behind Dennis Bergkamp and Tony Adams. Owen recorded many personal feats during the season and helped Liverpool challenge for the league championship, but ultimately a run of bad form in February saw the club bowing out of the title race. The Liverpool Echo wrote that, "[Owen] has become Liverpool's most precious performer and, quite simply, their saviour." Owen signed a five-year contract with Liverpool worth £2.5 million during the season. His £10,000-a-week deal made him the highest-paid teenager in the history of British football. Owen was runner-up to Zinedine Zidane in the World Player of the Year award, also finishing in fourth position in the FIFA World Player of the Year and European Player of the Year international awards. Following their successful bid, Owen was presented with the number 11 shirt by Real Madrid. Owen joined the club during its Galácticos era, and played alongside Ronaldo, Roberto Carlos, Raúl, Luís Figo, Zinedine Zidane and his England teammate David Beckham. Owen had a slow start to his Madrid career. He was often confined to the bench and drew criticism from fans and the Spanish press for his lack of form. A successful return to action with the England squad in October 2004 seemed to revive his morale, however, and in the first following match, he scored his first goal for the club, the winner in a 1–0 Champions League victory over Dynamo Kyiv. A few days later, he scored his first La Liga goal in a 1–0 victory over Valencia. The scoring spree continued, as he found the back of the net in three of the next four matches to make it five goals in seven successive matches. On 24 August 2005, Newcastle United announced that they had agreed a club record fee  of £16.8 million to obtain Owen, although they still had to negotiate with the player's advisers. Liverpool and local rivals Everton entered the fray, but were unwilling to match Madrid's asking price. As the 2006 World Cup was less than a year away, Owen wanted to get more playing time to secure his position as the first-choice striker in the England squad and joined Newcastle amid rumours that he had inserted an escape clause valued at £12 million. On 31 August 2005, Owen signed a four-year contract to play for Newcastle, despite initial press speculation that he would rather have returned to Liverpool. Some 20,000 fans were present at Newcastle's home ground of St James' Park for Owen's official unveiling as a Newcastle player. Several days after signing, he suffered a thigh-injury in pre-season, which ruled him out for the start of the 2005–06 season. He scored his first goal for the club on his second appearance, the second goal in a 3–0 away win at Blackburn Rovers on 18 September, Newcastle's first win of the season. Owen scored his first hat-trick for Newcastle in the 4–2 away win over West Ham United on 17 December. It was also a "perfect hat trick", with one goal scored with each of his left foot, right foot and head. On 31 December 2005, Owen broke a metatarsal bone in his foot in a match against Tottenham Hotspur. He underwent surgery to place a pin in the bone, to help speed the healing process. He was expected to be out of action until late March,  but the healing process did not go as hoped and on 24 March he underwent a second, minor operation. Owen then stated that he should be fit for the final few weeks of the season with Newcastle. His return to action finally came against Birmingham City on 29 April when he came off the substitutes' bench in the 62nd minute. After the match, Owen stated that he was "not 100% happy" with his foot. He underwent a further X-ray and made himself unavailable for Newcastle's final game of the season. After over three months without a goal, Owen scored the first goal of the second Kevin Keegan era in a 4–1 FA Cup third round replay win over Stoke City on 16 January 2008, although Keegan was only a spectator in the stands for this game. Owen was awarded the captaincy by Keegan on 19 January 2008. He scored his first league goal of 2008 on 3 February. Owen's goal in the 2–0 defeat of Fulham on 22 March 2008, which marked Newcastle's first win under Keegan's second spell as manager, also marked the first time in his Newcastle career that Owen had scored more goals for Newcastle than against them. By 5 April 2008, after his and the team's early season poor form, Owen had scored six goals in the previous six matches, with Newcastle registering four wins and two draws, lifting Newcastle into mid-table after earlier relegation fears. 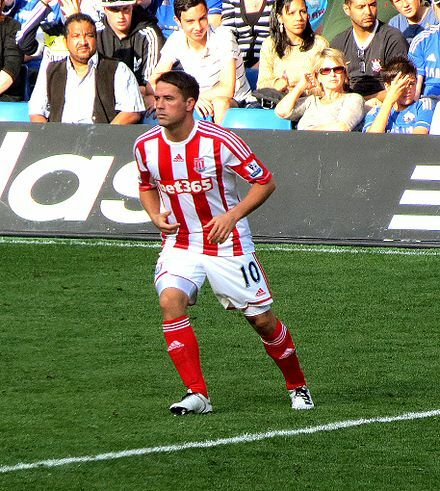 In the final game of the season, Owen scored in a 3–1 loss at Everton, finishing with 11 goals in total, putting him in equal 13th position for Premier League goals for the 2007–08 season. Owen missed all of the pre-season matches and training of the 2008–09 season due to a bout of mumps, which also kept him out of the international friendlies with the USA and Trinidad and Tobago in May 2008. He also suffered a calf strain during the summer months which kept him out of the opening game of the season against Manchester United at Old Trafford, a game which Newcastle drew 1–1. He made his return in the second game of the season against Bolton Wanderers on 23 August 2008, coming on in the 53rd minute for the injured Obafemi Martins. He scored the winning header in the 71st minute, with the game finishing 1–0. Three days later, he was named on the bench in a League Cup match away to Coventry City, he came on as a substitute and scored the winner in extra time in a 2–3 victory. In the 2008–09 season, he featured more consistently than in prior seasons, scoring four goals in twelve league appearances. 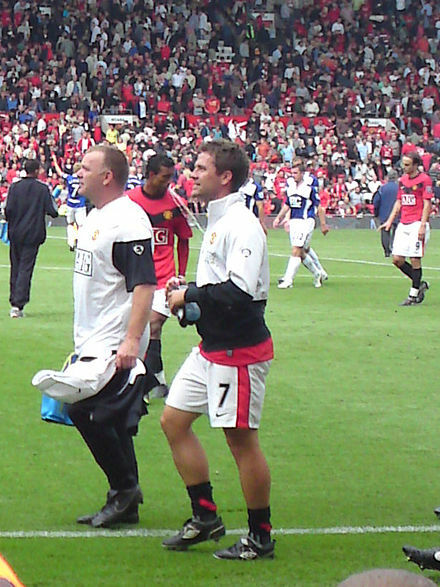 Owen (wearing No.7) at his Manchester United début, against Birmingham City on 16 August 2009. Owen scored his first goal for United back from injury in a 7–1 pre-season victory against a League of Ireland XI on 4 August 2010 at the newly built Aviva Stadium. On 22 September 2010, Owen netted his first goals of the season as he netted twice during a 5–2 away win over Scunthorpe United in the third round of the League Cup. Four days later, Owen scored his first league goal of the season as he netted United's second equaliser with his first touch in a 2–2 away draw against Bolton Wanderers. Owen's first goal of 2011 came in United's 2–1 FA Cup victory over Southampton at St Mary's Stadium on 29 January. 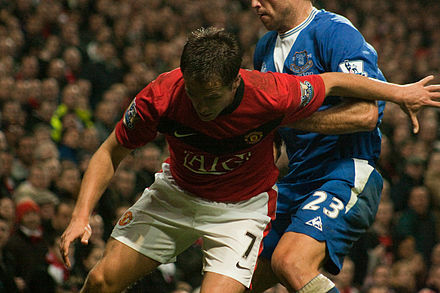 On 25 February, United manager Alex Ferguson said that Owen was a key part of his squad for the rest of the season. However, he suffered a groin injury and missed his team's next four games. His return match was on 19 March when he returned to the bench for United's game against Bolton. Owen started in United's home Champions League group stage match against Oțelul Galați on 2 November, however he was substituted early in the first half when he pulled up with a thigh injury; this was his last appearance for the team. In February 2012, Owen started light training with the Manchester United squad. From April 2012, Owen started full training but was not yet ready for first team games. On 13 May 2012, Owen was named as a substitute against Sunderland in United's final fixture, but he was not brought on. Owen was capped 89 times for England and scored 40 goals. He is fifth in the list of all-time top scorers for the England team, behind Wayne Rooney (53), Bobby Charlton (49), Gary Lineker (48) and Jimmy Greaves (44). He is also England's second-highest goalscorer in competitive international matches, behind Rooney. His 89 caps also place him as England's eleventh most capped player. 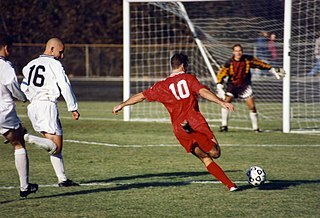 Owen had a highly successful record at Youth level, playing for the England under-20 team at the 1997 FIFA World Youth Championship and scoring three goals in four games. He played once for the England under-21 team, scoring in a win over Greece at Carrow Road. Owen's youthful enthusiasm, pace and talent made him a popular player across the country,  and many fans were keen for him to be selected for the 1998 World Cup in France. In a pre-World Cup friendly against Morocco, Owen scored his first goal for England. The goal also made him the youngest ever player to have scored for England,  until his record was surpassed by Wayne Rooney in 2003. Owen was selected for the World Cup squad by manager Glenn Hoddle, becoming England's youngest ever player at a World Cup when he came on as a substitute in the opening match against Tunisia. In the following match, a 2–1 defeat to Romania, Owen again appeared as a substitute. His equalising goal made him England's youngest ever goalscorer in the tournament at the age of 18 years and 190 days. In stoppage time, he hit the post with a long range shot, almost salvaging a point from the game. Because of his impact against Romania, Hoddle selected Owen in the starting line-up for England's decisive group match against Colombia. England won the match and Owen retained his place for the second round match against Argentina. In April 2002, he was named as England's captain for a friendly match against Paraguay in place of the injured regular captain David Beckham. Owen was the youngest England captain since Bobby Moore in 1963,  and in the following few seasons regularly deputised for Beckham as Eriksson's vice-captain. At the tournament proper, Owen again failed to score during the group stage. He then scored in the third minute of the quarter-final with Portugal, becoming the first England player to score in four consecutive major tournaments. England went on to lose on penalties after a 2–2 draw. Owen met Louise Bonsall at primary school in 1984. The couple bought Lower Soughton Manor in Flintshire, North Wales, where they keep his cars and her horses. They were engaged on 14 February 2004, and married on 24 June 2005,  at the Carden Park Hotel in Chester, Cheshire. The couple had initially planned to get married at their home, but changed plans when they were informed that if a licence was granted for a marriage ceremony the venue must be made available for other weddings for three years,  so opted to marry in a register office in informal clothing and have a lavish reception the next day in the grounds of their home. Emile William Ivanhoe Heskey is an English former professional footballer who played as a striker. He made more than 500 appearances in the Football League and Premier League over an 18-year career, and represented England in international football. He also had a spell in Australia, playing for the A-League club Newcastle Jets. Robert Bernard Fowler is an English former professional footballer and manager who played as a striker from 1993 to 2012. Fowler was known for being a natural scorer with an instinctive goal-poaching ability. Craig Douglas Bellamy is a Welsh former footballer who played as a forward. He is currently a pundit for Sky Sports. Alan Smith is an English footballer who last played for Notts County. He has also represented the England national team, winning 19 caps. Peter James Crouch is an English professional footballer who plays as a striker for Premier League club Burnley. He was capped 42 times by the England national team between 2005 and 2010, scoring 22 goals for his country in that time, and appearing at two World Cups. Scott Matthew Parker is an English professional football manager and former player who played as a midfielder in a 20-year career spanning from 1997 to 2017. He is the caretaker manager of Fulham. Glen McLeod Cooper Johnson is an English former professional footballer who played predominantly as a right back. Michael Richard Dawson is an English professional footballer who plays as a defender for Championship club Nottingham Forest. Adam David Lallana is an English professional footballer who plays as an attacking midfielder for Premier League club Liverpool and the England national team. Martin Škrtel is a Slovak professional footballer who plays as a centre back for Fenerbahçe. Andrew Thomas Carroll is an English professional footballer who plays as a striker for Premier League club West Ham United and the English national team. Dwight Devon Boyd Gayle is an English professional footballer who plays as a striker for West Bromwich Albion of the Championship, on loan from Premier League club Newcastle United. Jesse Ellis Lingard is an English professional footballer who plays as an attacking midfielder or as a winger for Premier League club Manchester United and the England national team. ↑ "Michael Owen". BT Sport. Retrieved 7 March 2019. ↑ "Pele's list of the greatest". BBC Sport. 4 March 2004. Retrieved 22 November 2013. ↑ "Michael Owen: his career in numbers". Guardian. 19 March 2013. Retrieved 19 March 2013. ↑ Arnhold, Matthias (29 January 2009). "England – Record International Players". Rec.Sport.Soccer Statistics Foundation. Archived from the original on 2 April 2009. Retrieved 11 February 2009. 1 2 3 4 "JockBio – Michael Owen". JockBio. Retrieved 13 December 2009. ↑ Edwards, John (29 May 2009). "Moyes to offer boyhood Toffees fan Owen an Everton escape route". Daily Mail. London. Retrieved 13 December 2009. 1 2 Devine, Darren (29 December 2008). "Michael Owen's wife recalls paralysis fear". Wales Online. Archived from the original on 16 October 2011. Retrieved 13 December 2009. 1 2 3 "Michael Owen facts". JockBio. Retrieved 13 December 2009. 1 2 3 4 5 6 7 8 9 10 11 12 13 14 15 16 17 18 19 20 21 22 23 "Michael Owen – Player Profile". lfchistory.net. Retrieved 31 August 2012. 1 2 "Michael Owen: Legend or villain?". ESPN. 13 December 2010. Archived from the original on 22 January 2013. Retrieved 31 August 2012. 1 2 "MICHAEL OWEN". Liverpool F.C..tv. Archived from the original on 22 March 2007. Retrieved 8 June 2007. 1 2 3 "Michael Owen Biography". Hello. Retrieved 18 December 2009. 1 2 "Owen is ready for big time". Liverpool Echo. January 1997. Retrieved 31 August 2012. ↑ "4 seconds – That's all it took Owen to prove his genius to amazed England bosses". People. 31 August 1997. Retrieved 31 August 2012. 1 2 3 4 5 "Lifeless Liverpool wave the white flag". Press Association. 6 May 1997. Retrieved 31 August 2012. ↑ "Bergkamp nets new year's honour". BBC Sport. 1 May 1998. Retrieved 31 August 2012. 1 2 "Liverpool Echo report". Liverpool Echo. 14 February 1998. Retrieved 31 August 2012. ↑ "Sad Vialli throws in title towel". The Independent. 26 April 1999. Retrieved 31 August 2012. 1 2 "Liverpool Daily Post report". Liverpool Daily Post. 22 January 2000. Retrieved 31 August 2012. 1 2 "Owen shrugs off fitness fears". BBC Sport. 24 May 2000. Retrieved 26 May 2007. 1 2 "Liverpool win the greatest final". The Guardian. 16 May 2001. Retrieved 31 August 2012. ↑ "Owen's crowning glory". BBC Sport. 17 December 2001. Retrieved 27 May 2007. ↑ "Five minutes that turned the world upside down". The Guardian. 14 May 2001. Retrieved 31 August 2012. ↑ "Owen spikes the Gunners". The Guardian. 14 May 2001. Retrieved 31 August 2012. 1 2 "Owen takes strain for Liverpool". The Daily Telegraph. 24 April 2002. Retrieved 31 August 2012. ↑ "Ipswich slip away with a whimper". The Daily Telegraph. 11 March 2002. Retrieved 31 August 2012. ↑ "Title race wide open as Owen rescues Liverpool". The Daily Telegraph. 29 December 2001. Retrieved 1 September 2012. ↑ "Owen signs four-year contract at Anfield". The Daily Telegraph. 26 September 2001. Retrieved 1 September 2012. ↑ "Diao drives fans to turn on Venables". The Daily Telegraph. 19 October 2002. Retrieved 1 September 2012. 1 2 "Reds and Blues overlooked amid controversy". Daily Post. 29 April 2003. Retrieved 1 September 2012. ↑ "Chelsea's triumph is poetic justice". The Daily Telegraph. 19 October 2002. Retrieved 1 September 2012. ↑ "The Joy of Six vs Chelsea". The Guardian. 4 February 2011. Retrieved 1 September 2012. ↑ "Owen hits century mark in rout". The Daily Telegraph. 26 April 2003. Retrieved 1 September 2012. 1 2 3 "Liverpool move to keep Owen". BBC Sport. 15 May 2003. Retrieved 2 September 2012. ↑ "Owen deal close". Daily Mail. 2 September 2003. Retrieved 2 September 2012. ↑ "The gossip column". BBC Sport. 30 November 2003. Retrieved 2 September 2012. ↑ "Game of the Week". ESPN. 3 November 2003. Retrieved 2 September 2012. ↑ "Beckham angers Barca". BBC Sport. 19 June 2003. Retrieved 2 September 2012. ↑ "Owen's contract threat casts shadow over Anfield". Independent. 13 November 2003. Retrieved 2 September 2012. ↑ "Owen makes Liverpool vow". BBC Sport. 16 November 2003. Retrieved 2 September 2012. ↑ "Owen's rescue act adds weight to Allardyce theory". The Daily Telegraph. 9 March 2003. Retrieved 2 September 2012. 1 2 "Owen and Liverpool catching up rapidly". The Daily Telegraph. 13 November 2003. Retrieved 2 September 2012. 1 2 "What IS wrong with Owen?". Daily Mail. 16 March 2004. Retrieved 2 September 2012. 1 2 "Owen is ready to answer Houllier's prayers at Yeovil". The Daily Telegraph. 3 January 2003. Retrieved 2 September 2012. ↑ "Gerrard and Owen show City door marked exit". The Daily Telegraph. 11 February 2004. Retrieved 2 September 2012. ↑ "Owen rekindles Liverpool hope". The Daily Telegraph. 5 April 2004. Retrieved 2 September 2012. ↑ "Liverpool 1 – 1 Portsmouth". lfchistory.net. 15 February 2004. Retrieved 2 September 2012. ↑ "Owen double revives Liverpool". The Age. 5 April 2004. Retrieved 2 September 2012. ↑ "Liverpool stake their claim". The Daily Telegraph. 8 May 2004. Retrieved 2 September 2012. ↑ "Robson and Houllier sign off with smile". The Daily Telegraph. 15 May 2004. Retrieved 2 September 2012. ↑ "Owen move speculation increases". RTÉ Sport. 11 August 2004. Retrieved 27 May 2007. ↑ "Owen unveiled by Real". BBC Sport. 14 August 2004. Retrieved 8 June 2007. ↑ "Soccer: A first for Owen as Real beats back Dynamo Kiev". International Herald Tribune. 20 October 2004. Retrieved 9 September 2007. ↑ Wright, James (18 November 2004). "The perfect gentleman". TheFA.com. The Football Association. Archived from the original on 2 December 2008. Retrieved 9 September 2007. ↑ "Owen's golden touch helps Real keep title challenge alive". The Guardian. 11 April 2005. Retrieved 9 August 2013. ↑ "Michael Owen and Real Madrid". michaelowen.com.ar. Archived from the original on 12 August 2007. Retrieved 15 August 2007. ↑ "Newcastle 2006 Annual Report" (PDF). Newcastle United F.C. 1 June 2007. Archived from the original (PDF) on 2 October 2012. Retrieved 20 June 2011. ↑ "Owen signs". nufc.com. 31 August 2005. Retrieved 15 August 2007. ↑ "Newcastle prepare to unveil Owen". BBC Sport. 31 August 2005. Retrieved 26 May 2007. ↑ Whitten, Nick (1 September 2005). "He's the man". Shields Gazette . The Metro from South Shields to Newcastle was packed to the rafters, and it seemed every second person was wearing a Newcastle shirt with Owen's name on the back. ↑ "Owen completes move to Newcastle". BBC News. 31 August 2005. Retrieved 26 May 2007. ↑ "West Ham 2–4 Newcastle". BBC Sport. 17 December 2005. Retrieved 26 May 2007. ↑ "Owen denies problem at Newcastle". BBC Sport. 18 January 2006. Retrieved 26 May 2007. ↑ "Owen: I'll be 100% fit for World Cup". The Guardian. UK. 27 March 2006. Retrieved 26 May 2007. ↑ Austin, Simon (4 April 2006). "Grip confident about Owen fitness". BBC Sport. Retrieved 26 May 2007. 1 2 3 "Newcastle threaten to sue over striker's World Cup injury". Daily Mail. UK. 17 September 2006. Retrieved 3 July 2009. 1 2 3 "FIFA are adding insult to injury". The Journal . 1 March 2007. Archived from the original on 1 September 2010. Retrieved 3 July 2009. 1 2 3 Walker, Michael (26 June 2007). "Newcastle claim victory over £10m Owen pay-out". The Guardian. UK. Retrieved 3 July 2009. 1 2 "FIFA stands firm on Owen pay-out". BBC Sport. 28 February 2007. Retrieved 3 July 2009. ↑ "Toon 'warranted' says Macdonald". RTÉ Sport. 16 April 2007. Archived from the original on 21 July 2011. Retrieved 3 July 2009. ↑ Hope, Craig. "Michael Owen Up And Running". Newcastle United.co.uk. Archived from the original on 9 March 2007. Retrieved 26 May 2007. ↑ "Owen scores on return from injury". BBC Sport. 11 April 2007. Retrieved 11 April 2007. ↑ Hughes, Ian (30 April 2007). "Reading 1–0 Newcastle". BBC Sport. Retrieved 6 May 2007. ↑ Warren, Dan (13 May 2007). "Watford 1–1 Newcastle". BBC Sport. Retrieved 13 May 2007. ↑ "Shepherd tells Owen to stay loyal". BBC Sport. 9 May 2007. Retrieved 9 May 2007. 1 2 Charles, Chris (11 May 2007). "Review of the week". BBC 606. Retrieved 26 May 2007. ↑ Thomson, Daniel (12 May 2007). "Shepherd's Owen joke makes him a star". The Journal. Archived from the original on 9 July 2012. Retrieved 12 May 2007. ↑ "Allardyce reveals Owen exit fears". BBC Sport. 10 June 2007. Retrieved 10 June 2007. ↑ "Owen rejects Newcastle exit talk". BBC Sport. 12 July 2007. Retrieved 13 July 2007. ↑ "Owen scores in Allardyce opener". BBC Sport. 17 July 2007. Retrieved 20 July 2007. ↑ "Owen picks up minor thigh injury". BBC Sport. 20 July 2007. Retrieved 20 July 2007. ↑ "Owen gives England fitness boost". BBC Sport. 14 August 2007. Retrieved 15 August 2007. ↑ "Newcastle 2–0 Barnsley". BBC Sport. 29 August 2007. Retrieved 1 September 2007. ↑ Fletcher, Paul (1 September 2007). "Newcastle 1–0 Wigan". BBC Sport. Retrieved 1 September 2007. ↑ Taylor, Louise (25 September 2007). "England woe as Owen faces month out". The Guardian. Retrieved 25 September 2007. ↑ "Newcastle 3–2 Everton". BBC Sport. 7 October 2007. Retrieved 27 October 2007. ↑ Hetherington, Clive (18 November 2007). "Michael Owen injury infuriates Sam Allardyce". The Daily Telegraph. Retrieved 5 April 2010. ↑ "Owen delays decision". Sky Sports. 22 December 2008. Retrieved 25 June 2009. 1 2 3 "Hull 'serious' about bid for Owen". BBC News. 23 June 2009. Retrieved 25 June 2009. ↑ "Michael Owen wins damages from Daily Express over 'incredulous allegations'". The Guardian. UK. 3 June 2009. Retrieved 25 June 2009. ↑ "Michael Owen – An Apology". Daily Express. UK. 22 May 2009. Retrieved 25 June 2009. ↑ "Agents offer Michael Owen to clubs with help of 34-page brochure". The Guardian. UK. 14 June 2009. Retrieved 25 June 2009. ↑ Samuel, Martin (20 June 2009). "The Michael Owen brochure – 32-pages detailing why the Newcastle striker is not a spent force". Daily Mail. London. Retrieved 25 June 2009. 1 2 "Owen completes switch to Man Utd". BBC Sport. 3 July 2009. Retrieved 3 July 2009. ↑ Bellwood, Tom (3 July 2009). "Crossing the divide: Brave stars who pulled on the red of Liverpool and Manchester United". Daily Mail. UK. Retrieved 5 July 2009. ↑ Coppack, Nick (13 July 2009). "Owen: Injuries aren't an issue". Manchester United F.C. Retrieved 13 July 2009. ↑ "Owen hits winner on Man Utd debut". BBC Sport. 18 July 2009. Retrieved 18 July 2009. ↑ Thompson, Gemma (20 July 2009). "Malaysia XI 0 United 2". Manchester United F.C. Archived from the original on 14 July 2011. Retrieved 20 July 2009. ↑ Bostock, Adam (26 July 2009). "Greentown 2 United 8". Manchester United F.C. Archived from the original on 14 July 2011. Retrieved 26 July 2009. ↑ "Man Utd 1–0 Birmingham". BBC Sport. 16 August 2010. Retrieved 16 August 2010. ↑ "Wigan 0–5 Man Utd". BBC Sport. 22 August 2009. Retrieved 22 August 2009. ↑ McNulty, Phil (21 September 2009). "Man Utd 4–3 Man City". BBC Sport. Retrieved 21 September 2009. ↑ Dickinson, Matt (30 September 2009). "Michael Owen: I struggle to recall the goal against Manchester City". The Times. UK. Retrieved 30 September 2009. ↑ McNulty, Phil (3 November 2009). "Man Utd 3–3 CSKA Moscow". BBC Sport. Retrieved 3 November 2009. ↑ Ashenden, Mark (8 November 2009). "Wolfsburg 1–3 Man Utd". BBC Sport. Retrieved 8 November 2009. ↑ "Michael Owen ruled out for rest of season". BBC Sport. 5 March 2010. Retrieved 6 March 2010. ↑ Coppack, Nick (4 August 2010). "Ireland XI 1 United 7". Manchester United F.C. Retrieved 4 August 2010. ↑ Ashenden, Mark (22 September 2010). "Scunthorpe 2–5 Man Utd". BBC Sport. Retrieved 22 September 2010. ↑ "Bolton 2–2 Man Utd". BBC Sport. 26 September 2010. Retrieved 26 September 2010. ↑ Hughes, Ian (28 January 2011). "Southampton 1–2 Man Utd". BBC Sport. Retrieved 28 January 2011. ↑ Smyth, Rob (14 May 2011). "Blackburn v Manchester United – as it happened". The Guardian. Retrieved 4 September 2012. ↑ Nurse, Howard (14 May 2011). "Blackburn 1–1 Man Utd". BBC Sport. Retrieved 4 September 2012. ↑ McNulty, Phil (22 May 2011). "Man Utd 4–2 Blackpool". BBC Sport. Retrieved 20 June 2011. ↑ Nurse, Howard (1 June 2011). "Michael Owen signs new Manchester United deal". The Daily Telegraph. Retrieved 4 September 2012. ↑ "Leeds 0–3 Man Utd". BBC Sport. 20 September 2011. Retrieved 21 September 2011. ↑ Winter, Henry (26 October 2011). "Manchester United's derby pain eased as Dimitar Berbatov takes advantage of rare starting chance". The Daily Telegraph. Retrieved 27 October 2011. ↑ "Michael Owen Signs!". Stoke City F.C. 4 September 2012. Retrieved 4 September 2012. ↑ "Stoke 1–1 Man City". BBC Sport. Retrieved 16 September 2012. ↑ "No trial by TV for Michael Owen, says Stoke City boss Tony Pulis". The Sentinel. Retrieved 23 November 2012. ↑ "Swansea 3–1 Stoke". BBC Sport. Retrieved 19 January 2013. ↑ "Michael Owen: Footballer to retire at end of season". BBC Sport. Retrieved 19 March 2013. ↑ "Southampton 1-1 Stoke". BBC Sport. Retrieved 19 May 2013. ↑ "Michael Owen grateful for Stoke City ovation as he ends career". BBC Sport. Retrieved 19 May 2013. ↑ "Montenegro 1 England 1 match report: Imperfect England suffer familiar blow after Wayne Rooney scores opener in Podgorica". The Independent. 27 March 2013. Retrieved 26 June 2013. ↑ "England's World Cup Final Tournament Player Record Performances". 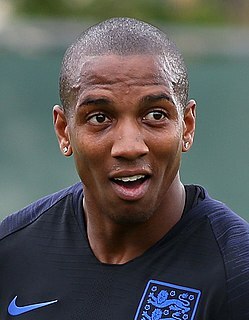 englandfootballonline.com. Retrieved 8 November 2007. ↑ "Michael James Owen – Biography". footballdatabase.com. Retrieved 25 August 2007. ↑ "Michael Owen". Newcastle United. Archived from the original on 12 August 2007. Retrieved 25 August 2007. ↑ "Michael Owen's Life". biogs.com. Retrieved 25 August 2007. ↑ "Morocco 0–1 England". Englandfc.com. 27 May 1998. Archived from the original on 16 August 2007. Retrieved 25 August 2007. 1 2 "Michael Owen: Gary Lineker praises former England striker". BBC. 19 March 2013. ↑ "Owen solo in St-Etienne". TheFA.com. The Football Association. 8 March 2013. Retrieved 26 June 2013. ↑ "England pay penalty again". BBC. 30 June 1998. Retrieved 26 June 2013. ↑ "Sports Personality of the Year – previous winners". BBC. Retrieved 8 November 2007. ↑ "Shearer leads England rout". BBC. 4 September 1999. Retrieved 26 June 2013. ↑ "Who can replace Shearer for England?". BBC. 2 July 2000. Retrieved 26 June 2013. ↑ "Owen crowned king of Europe". The Guardian. 18 December 2001. Retrieved 26 June 2013. ↑ "Owen named England captain". BBC Sport. 16 April 2002. Retrieved 8 November 2007. ↑ "Portugal break England hearts". BBC. 24 June 2004. Retrieved 26 June 2013. ↑ "Colombia 2-3 England". BBC. 31 May 2005. Retrieved 26 June 2013. ↑ "Argentina 2-3 England". BBC. 12 November 2005. Retrieved 26 June 2013. ↑ "England B 1–2 Belarus". BBC Sport. 25 May 2006. Retrieved 8 November 2007. ↑ "Sweden 2–2 England". BBC Sport. 20 May 2006. Retrieved 25 August 2007. ↑ "Owen ruled out for several months". BBC Sport. 21 June 2006. Retrieved 4 May 2007. ↑ Stewart, Rob (19 March 2009). "Michael Owen regrets making comeback at 2006 World Cup finals". The Daily Telegraph. Retrieved 4 September 2012. ↑ "Owen may face season on sidelines". BBC Sport. 17 August 2006. Retrieved 26 May 2007. ↑ "England B 3–1 Albania". BBC Sport. 26 May 2007. Retrieved 26 May 2007. ↑ "Beckham recalled to England squad". BBC Sport. 26 May 2007. Retrieved 26 May 2007. ↑ "Sharp Owen set for England return". BBC Sport. 26 May 2007. Retrieved 26 May 2007. ↑ Hatherall, Chris (8 June 2007). "Owen's honour". TheFA.com. The Football Association. Archived from the original on 29 October 2007. Retrieved 8 June 2007. ↑ Sanghera, Mandeep (8 September 2007). "England 3–0 Israel". BBC Sport. Retrieved 9 September 2007. ↑ "Owen to be offered England role after revealing he is quitting in the summer". Daily Mail. 19 March 2013. Retrieved 26 June 2013. ↑ "Michael Owen hits out at Fabio Capello for his England exile". The Guardian. 25 May 2011. Retrieved 26 June 2013. ↑ "Owen, il principe ereditario" (in Italian). La Gazzetta dello Sport. 29 May 1998. Retrieved 18 December 2014. 1 2 "meraviglia di ragazzo" (in Italian). La Gazzetta dello Sport. 1 December 2001. Retrieved 18 December 2014. 1 2 3 4 5 6 "Owen, il bravo ragazzo nato per essere grande" (in Italian). La Repubblica. Retrieved 18 December 2014. ↑ "Michael Owen: One of the best careers any Englishman has ever had". FourFourTwo.com. Retrieved 18 December 2014. 1 2 3 "Michael Owen: 'Vicino a Crespo farei follie'" (in Italian). La Repubblica. 27 March 2001. Retrieved 18 December 2014. ↑ "Head the ball like Michael Owen". BBC. Retrieved 18 December 2014. ↑ "l' Inter fa l' esame al gioiellino Owen" (in Italian). La Gazzetta dello Sport. 4 August 1998. Retrieved 18 December 2014. ↑ "Owen, precario di lusso Ora cerca lavoro con un book" (in Italian). La Gazzetta dello Sport. 15 June 2009. Retrieved 18 December 2014. 1 2 "Star Owen switches wedding plans". BBC News. 5 May 2005. Retrieved 26 May 2007. ↑ "Michael Owen marries girlfriend". BBC Newsround. 24 June 2005. Retrieved 13 November 2008. ↑ "Baby joy for Owen". BBC News. 1 May 2003. Retrieved 26 May 2007. ↑ "Michael A Dad Again". 31 October 2007. Retrieved 31 October 2007. ↑ Dickinson, Matt (1 March 2010). "Michael Owen tastes the sweet and sour at Wembley". The Times. Times Newspapers. Retrieved 4 September 2012. ↑ Rayment, Sean (2 January 2006). "One millionaire footballer's new goal: to fly like a Bond villain". The Daily Telegraph. Retrieved 13 July 2007. ↑ "Sky-high bills 'ground Michael Owen'". The Journal. Newcastle: ncjMedia. 28 August 2006. Archived from the original on 1 October 2012. Retrieved 30 July 2010. ↑ "Star's old home for sale". BBC News. 12 January 2004. Retrieved 26 May 2007. ↑ "Kidnap attempt on Owen's sister". BBC News. 16 February 2004. Retrieved 26 May 2007. ↑ "Twitter" . Retrieved 28 April 2011. ↑ Keogh, Frank (16 June 2011). "Royal Ascot: Michael Owen's tears of joy at winner". BBC Sport. Retrieved 27 November 2011. ↑ Armytage, Marcus (29 March 2015). "Michael Owen's 'horse of a lifetime' Brown Panther wins Dubai Gold Cup". Daily Telegraph. London. Retrieved 29 March 2015. ↑ "Michael Owen 'delighted' with finishing second on horse racing debut at Ascot". The Daily Telegraph. 24 November 2017. 1 2 "Owen stars in his own soap". BBC News. 7 March 2004. Retrieved 26 May 2007. ↑ "Michael Owen fronts PES 08". Euro Gamer. Retrieved 27 October 2007. ↑ "SOCCER Michael Owen". michaelowenpics.com. Archived from the original on 13 May 2007. Retrieved 27 October 2007. ↑ "Jaguar Signs Agreement With Michael Owen". cwn.org.uk. 4 May 1999. Retrieved 1 September 2007. ↑ "Michael Owen: My town". FIFA. Archived from the original on 20 February 2009. ↑ Endlar, Andrew. "Michael Owen". StretfordEnd.co.uk. Retrieved 2 October 2010. ↑ "Michael Owen". National Football Teams. Benjamin Strack-Zimmerman. Retrieved 3 May 2011. ↑ Michael James Owen – Goals in International Matches Archived 8 February 2011 at the Wayback Machine . Rec.Sport.Soccer Statistics Foundation.com (23 April 2008). Retrieved 3 May 2011. 1 2 3 4 "Take a look at my medals! Owen hits back at Twitter trolls with picture of trophy cabinet". Daily Mail. 1 January 2013. Retrieved 6 October 2014. 1 2 3 "Michael Owen: Overview". Premier League. Retrieved 17 April 2018. ↑ "ESM XI". The Rec.Sport.Soccer Statistics Foundation. Archived from the original on 7 February 2016. Retrieved 18 July 2015. ↑ "Sports Personality roll of honour". BBC Sport. Retrieved 6 October 2014. ↑ "Topical Top 10s". Sky Sports. Archived from the original on 8 October 2014. Retrieved 6 October 2014. 1 2 "Player profile - Michael Owen". Liverpool History. Retrieved 6 October 2014. ↑ "Zidane lights the blue-touch paper for France". FIFA. Retrieved 6 October 2014. ↑ Davies, Christopher (15 April 2003). "Seaman is the greatest, says Shearer". The Telegraph. London. Archived from the original on 1 October 2009. Retrieved 1 October 2009. ↑ "These are the 125 players selected by Brazilian legend Pele to mark Fifa's 100th anniversary". BBC Sport. 4 March 2004. Retrieved 6 October 2014. ↑ "MICHAEL OWEN". National Football Museum. 25 March 2015. Retrieved 9 July 2015. ↑ "LEGENDS – GoldenFoot". Golden Foot. Retrieved 5 January 2017. ↑ "Casillas admits retirement is looming following Golden Foot award". Marca. 8 November 2017. Retrieved 8 November 2017. Wikimedia Commons has media related to Michael Owen .